It's been a crazy few weeks in this household, as many of you know. One thing we always like to do is to sit down and watch a family-friendly movie. Sometimes, scheduling that in isn't too easy. We finally did sit down to watch Grace of God last night, and we really enjoyed it. The Dove.org thing says this is faith friendly for ages 12+, but we all watched it (including the 9- and 11-year-olds) and I thought it was fine for everyone. Part of the concern for younger viewers might be all the questioning of faith going on. The detective is fairly antagonistic about faith issues when he arrives to start trying to figure out what happened with the $30,000 from the safe. He isn't a real likeable guy, and he raises some tough questions. My 17-year-old spent a lot of time talking back to the screen, so the movie took much longer than the 1:39 it is supposed to last. We had to keep pausing, as he'd be responding to something the detective had said. We all talked back when he said something about the church being full of hypocrites. As our pastor says to that, "Oh, no! We're not full of hypocrites. There is always room for one more! Won't you join us on Sunday?" I have a DVD to give away! US and Canada only, please. 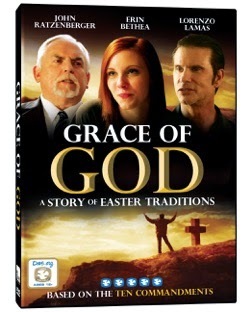 We enjoy faith-based family films and include the entire family plus the boyfriends when we watch!